What Is Artesano Provençal Verdure Porcelain? Garden ponds can be havens for wildlife. They can provide a damp, safe, habitat for frogs, toads, newts and other amphibians to live and encourage helpful insects to your garden. They also act as water sources for helpful mammals such as hedgehogs who will be glad of a drink after munching your unwanted slugs. Unfortunately for fish owners ponds also attract birds such as herons who see your pond as nothing more than a convenience store, amply stocked with ready-meals. There are many water protection products on the market designed to protect your pond such as plastic herons intended to trick the real birds into believing that another heron has got there first. Such deterrents are pretty limited in scope. A plastic heron will do nothing against next door’s cat! The best solution is to prevent the predators from lifting the fish out of the water. Plastic pond grids come in a variety of styles and are often fitted so that they are clearly visible to would-be hunters, although invisible fitting is possible with some designs. The grid floats on the water, although anchoring is possible if required. By ensuring that the fish cannot be removed from the pond without removing the mesh, the pond becomes a far less inviting hunting prospect allowing your fish to swim in peace. The pond grids can be cut to shape so that even very intricate pond shapes can be protected, and some can take the weight of plants, allowing you to create unusual “floating island” floral displays. Many families decide against having a pond in the garden due to the risk it poses to their children. Pond grids are designed to prevent drowning by providing a barrier against falling into the pond. Unlike fish grids, which are intended more as a barrier against the fish being removed than as a protection against falling in, safety grids are held in place by strong aluminium beams. The height of these is adjusted for each individual pond which allows for ponds with varying depths to be catered for. The grids themselves can be cut to any size or shape and are then fitted together and the edges capped to prevent damage to the pond liner. Depending on the aesthetics and level of protection needed the grid can be fitted protruding from the usual water level or just below it, rendering it almost invisible. 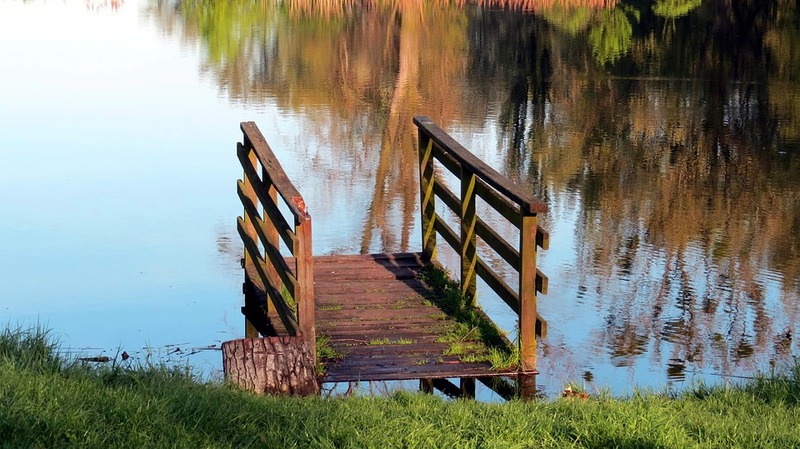 When purchasing pond grids it is important to ensure that the materials used are safe for use in ponds, adhering to the current standards for outdoor applications in submerged conditions. Cheap plastics can become brittle from UV rays, eventually rendering them useless, so it important to look for plastic that has been UV stabilized. Plastic has been portrayed as the enemy recently, especially in aquatic and marine environments. The problem is the use of cheap, throwaway plastics that are not recyclable and that are not disposed of correctly. For use in long-term applications, such as pond grids, plastic is the ideal material as it does not rust, tarnish or rot which means it won’t contaminate the water. It is also light for its strength, meaning you do not risk placing undue strain on the pond liner causing it to tear and leak. In fact, many pond grids are safety tested to be able to withstand the force of a fully-grown male falling into the water. The equivalent metal, wood or rope protection would be more visible and shorter lived than a plastic pond grid.